I am writing this while contemplating the evening sunlight on the Minster. This winter there have been many sunny weekends, but paths are muddy and National Trust or English Heritage sites and country houses are closed for spring cleaning. What a blessing it is to find churches in East Yorkshire open with sunlight pouring through the windows on to altar, pulpit and pews. A visitors’ book is open with a pen ready for visitors, unless someone has inconveniently ‘borrowed’ it, and informative pamphlets of every kind invite you to take them and leave an offering in the wall safe. 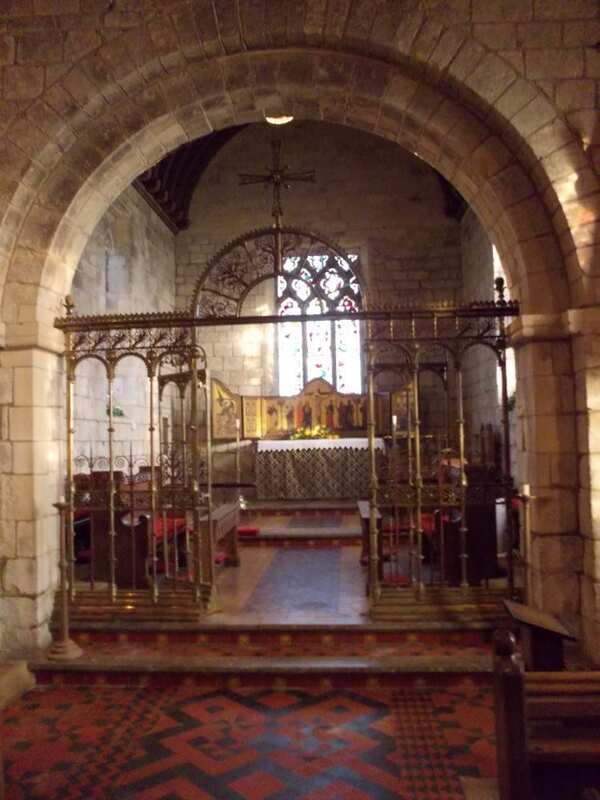 One of the loveliest discoveries we have recently made is of two churches in neighbouring villages, one built and the other preserved by, perhaps, the most outstanding Victorian church patron anywhere in England. Sir Tatton Sykes II’s seat at Sledmere is closed for the winter, but his churches are not. He built seven on the Sledmere estate alone and restored another eight. In addition he built rectories and village schools. Sir Tatton Sykes II was born in 1826. He inherited the family estates from his father when he was 37, and died in 1913. His father, Sir Tatton Sykes I, had restored three Norman churches and built a new one at Hilston, clearly inspiring his son to go further. hillside above the village of Weaverthorpe. 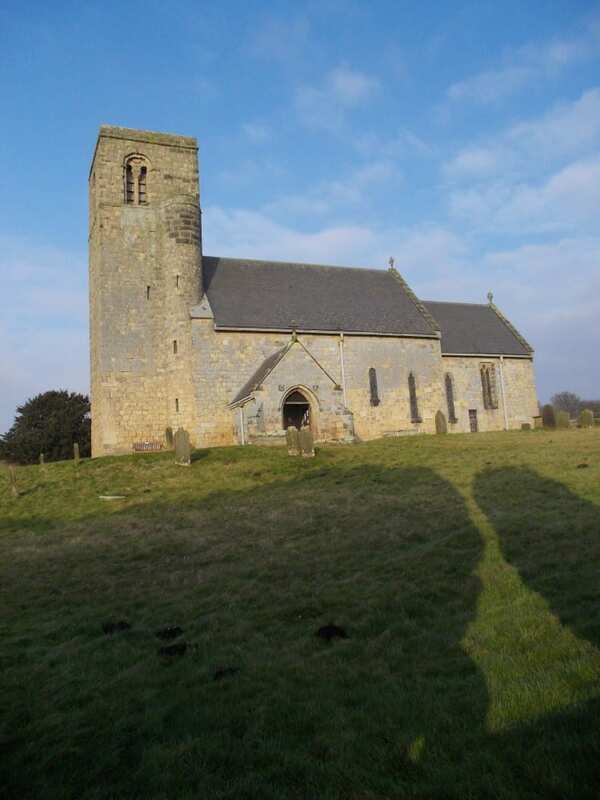 Norman churches were built alongside a manor house with a farm and substantial outbuildings. Now St. Andrew’s church is isolated in its churchyard. Inside the vast churchyard, the grass is deliberately left only lightly trimmed to provide wild life habitat, particularly for butterflies. One large notice board describes the wildlife; another has a plan and describes what happened to the manor house and home farm. Below the churchyard, southwards towards the village in the valley, you can still make out the mounds where walls once enclosed the manorial hall and surrounding rooms. The churchyard has been enlarged to the east over meadows where the farm buildings were. Above the south door on the village side is a Latin inscription stating that Herbert, the chamberlain of Winchester, built the church. He was chamberlain to Henry I and was granted the manor of Weaverthorpe 44 years after the Norman Conquest in 1110. The original windows were enlarged in the 13th and 14th centuries, while inside are sturdy Norman arches, restored for Sir Tatton Sykes II by G.E.Street in 1870 – 72. Most of the church furniture and floor tiles were provided by the famous Clayton & Bell company. The Norman font is particularly attractive with its lacy pattern of small circles and octagons. The patron saint is honoured by a large stone sculpture by James Redfern, a Victorian sculptor I hadn’t heard of. Intriguingly, medieval tombstones have been used in the south porch; outside it is a weathered mid-14th century statue of a civilian praying, probably once on the church wall. It was late afternoon before we moved a few miles on to the village of Helperthorpe. The church is up an unsigned road on the right just before you enter the village. 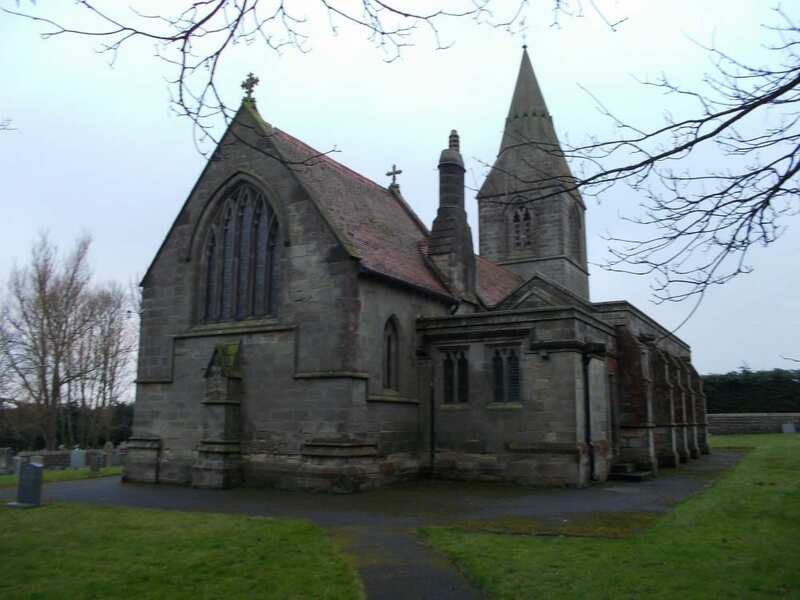 In the same years he was restoring Saint Andrew’s at Weaverthorpe, in 1871 – 3 G. E. Street designed Saint Peter’s for Sir Tatton Sykes II. The stone came from Whitby and, like all Sir Tatton’s churches, it is entirely original, clearly inspired by Gothic architecture but with pure Victorian changes and additions. As you enter the churchyard, you cannot help noticing a strange stone band at the east end that rises to indicate some inside feature. This is explained inside by the level of the altar, raised eight steps above the nave. I do not recall ever having seen such an impressive feature in a parish church. Sited on the hillside like the Norman church at Weaverthorpe, we couldn’t find a direct path down to the village without tramping through gardens. The car park is by the parsonage, also by G. E. Street, and the only way back was a roundabout way to the road and down to the village. By then it was getting dark.